Make this charm bag on the day of Venus, Goddess of Love. Venus’s specific hours are the 8th hour of the day and the 10th and 3rd hours of the night. Do this spell during the waxing phase of the moon. Charm bags are wonderful; it’s like carrying magick with you. It’s a subliminal reminder of the love that is coming into your life and they are really effective. When I was a younger witch, new to the path, almost every spell I did was a mental chant or a charm bag. They are great because even newbies have success with them. I still do charm bags very often because I love the simplicity of them. Use the search to your right and type ‘how to make a charm bag’ for more information on how to make them. 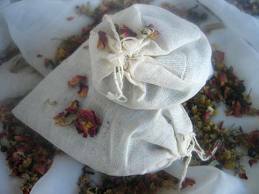 During the waxing moon at your ideal hour place the items into the bag. Use a mix of yellow, white, light blue and pink yarn the seal the bag. Carry the pouch with you in your pocket or purse. Every morning take the pouch and give the Goddess thanks for the love that’s on its way to you. Feel happy and excited and go out into the day in a great mood. Do this every day and every night until the love you want to draw comes to you. This is not a spell to obtain the love of specific person so do not think of a particular person while working this spell. Once you receive the love scatter the herbs into the wind and give thanks. Keep the rose quartz as a reminder and place it on your altar or nightstand.